Ever since she appeared in a BBC documentary on the National Gallery 19 years ago, ﻿Sister Wendy Beckett has taken the art world by storm. A familiar face on PBS, the surprisingly straight-talking contemplative nun is well-known for her unique insights into art and art history. 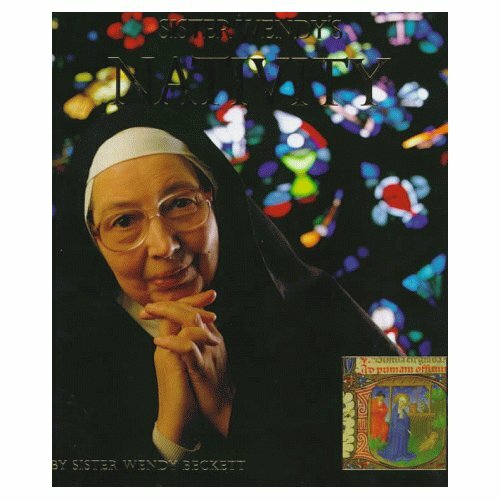 Sister Wendy is the author of more than 25 books, including one on the Nativity containing more than 40 paintings that illustrate events leading up to and including the birth of Jesus. The book also highlights moments from Christ’s life, death and resurrection. The Telegraph has an interesting Q&A with the 80-year-old nun. Solitary life: This is the greatest imaginable bliss. It wasn’t only that I wanted a contemplative life; I needed it. I am one of those inadequate people who can’t sustain the level of prayer and self-sacrifice that religious life asks, unless I have hours alone with God. But I am not totally alone. Once a day the sister who looks after me brings my post and gives me any messages. If there are practical matters to be seen to (I am a sadly impractical woman), she solves them. The day is surely coming when age and infirmity will make it impossible to live alone. I don’t worry about this because it’s all part of God’s plan. ﻿Television career: Nuns have to earn their living and I earned mine by doing medieval Latin translation. But I became unwell and asked the Mother Prioress if I could look at art until I felt better. Then I realised there are no livings to be earned by merely looking, so I decided to write a book, which drew the attention of the BBC. This is how my television career began. Christmas: My Christmas is a deeply privileged one and I spend it in silence marvelling at God’s goodness. I don’t put up decorations, wrap presents or attend a Christmas dinner (though I delight in giving and receiving cards). The high point is the high point of every day – attending Mass and receiving the Eucharist. This sacrament is Christmas in essence: God giving Himself, us receiving Him and being changed. About George P. Matysek Jr.
George P. Matysek Jr. is the assistant managing editor of The Catholic Review in Baltimore. View all posts by George P. Matysek Jr. This entry was posted on Wednesday, December 22nd, 2010 at 12:12 am	and tagged with religious art, sister wendy beckett and posted in Art and Culture, Christmas, Religious life. You can follow any responses to this entry through the RSS 2.0 feed.